I figured it was time for a wear to work look and I’ve been waiting to wear this look for about a year. I got this skirt from the Gap and I love the detail on it, it’s got a slight shine to it also so it dresses up the typical blue suit skirt. The blazer is from Kaitlyn and the white button-down under is from Gap (of course, I always wear something from Gap). I accessorized with heels from Guess and necklace from Juicy Couture. I’m always searching for more formal or wear to work outfits that are fashionable too, because it can hard to dress appropriately and still be stylish. One very clear trend I have seen, among my peers, who are just now renting their first apartments is that everyone is opting out of getting cable. When did cable die? I grew up on cable, and it wasn’t always about television shows, it was about the news and interviews with influential world figures. Then I got busy with school, completing college applications, and not getting home until 11 pm each night. I stopped watching television because television stopped fitting into my schedule. Then I went to college and for four years and I was constantly busy, and the only television shows I had time to watch were the ones that were recorded on the television in my sorority house. I did not follow shows on a regular basis, I would watch one or two episodes every now and then when someone else was playing a recording. Upon graduation, is it any wonder then that I opted out of paying for cable? For arguably the previous eight years of my life television had been utilized less and less. My situation is not universal, there are some who have had a completely opposite experience, for example one girl in my sorority kept a spreadsheet of her favorite shows and the times they aired so she could follow each one of them. However, she was the only friend I had who was so devoted to following her shows. At dinner with friends post-graduation, the topic of television and shows always comes up and the conversation always comes back to what channel or subscription service we watch everything on. Most of my friends have chosen to stick with Netflix or Hulu or Amazon Instant over traditional cable. When we have a discussion of world events we are citing articles online, not our nightly news as our sources. There has become a separation of fiction and nonfiction. During the day, we are reading articles on the web. We are getting to those articles from our social media networks most of the time, twitter. At night, when we are home and trying to relax we are following the latest television drama on Netflix. It’s comforting in most respects to view genres and be able to select whether we want to laugh, cry, or be terrified for the next 90 minutes of our life. That’s something you don’t always get to pick during the day, in the news. It’s about control and now we are able to control the content we watch, down to the speed at which we watch it. It was no surprise then when earlier this week I learned of the Supreme Court agreeing to hear the Aereo case. There has been a lot of speculation on the part of journalists and myself as to what this could mean for cable networks. Is this case cable’s swan song? While I’ll have to wait some time before getting my answer to that question, I leave you with this infographic (via Business Management Degree) which portrays an interesting battle. If all of the twenty-somethings and I start switching over will the battle come between subscription services like Amazon and Netflix? Be available to them and keep them in the loop. Always making the client aware of your actions is good because it lets them see the work you are doing as well as helps you make sure you are doing what they expect. Generally, as time goes on some clients may want less communication, which is normal and understandable. On that same note, there is one thing be cautious about, and that is devaluing their time by sending emails that too long, or pointless. The general rule that I abide by is that if it takes writing a long email, it’s probably worth meeting in person. Also try to respond to their emails promptly, I’ve found they will treat you with the same respect and respond quickly to yours as well. Anticipating what your client will need next is extremely important because it can be what sets you apart from not only other companies but in your industry looking seduce a lucrative client, but everyone they deal with on a daily basis. So, the next question is how do you go about this? Next time you give them suggestions for a project go a few steps further and think through all questions they might have. Going into a business meeting an agenda and expanding on that agenda certainly means extra work but it shows you really through things through. It will make you stand out; so go ahead and shine. Learn their subjective biases. It isn’t sucking up, it’s learning how to present your information to them in a way they will best understand. If your client isn’t good with certain programs, find what they are familiar with and adapt to them. Clients want someone they can trust, and treating them like a person will help establish that trust. It is easy to get caught up in formalities, but don’t forget to be a friend. One of my favorite sweaters was actually a hand-me-down from my roommate. She was about to throw it away and I asked to keep it. It’s incredibly simple, just a basic gray sweater with a lamb on it. I typically wear it with black jeans. 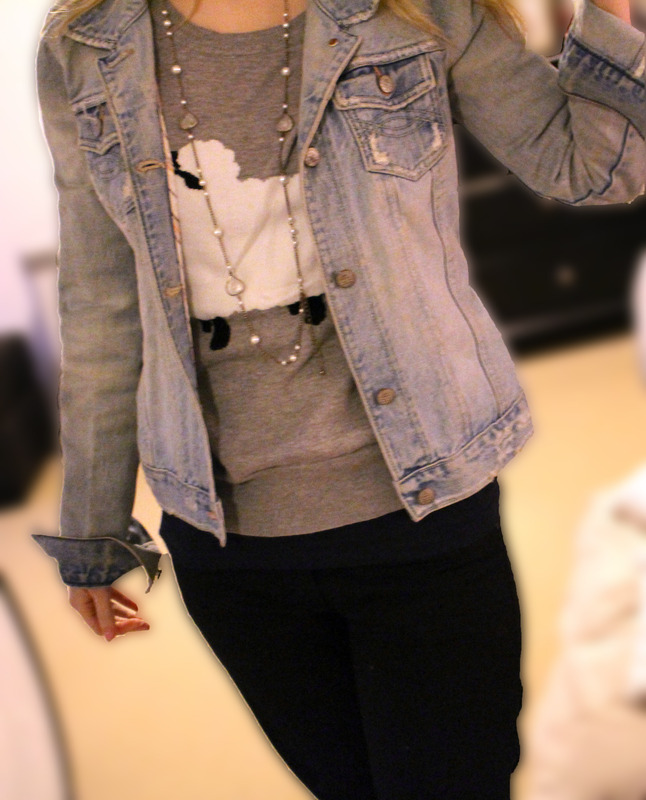 Since it is cold out I layered it with a tank underneath and an Abecrombie kids (yes, that’s right I said Abercrombie Kids) jean jacket on top. I threw a necklace over it to dress it up a little. I love this outfit because it’s a combination of a variety of pieces. The sweater is a recent hand-me-down, the jeans are relatively new, within the year, and the jacket I got probably when I was in middle school. My shoes are flats (I’ll do anything to avoid wearing heels) that I scored at Kohl’s a few months ago for under $20. Great Bag Finds for $50 or less! 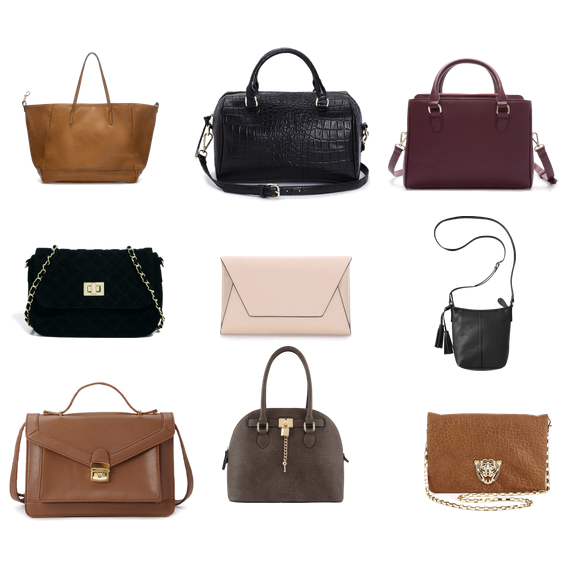 Every woman needs great accessories to keep all her belongings as she is on the go. Here are some bags to get you in the Fall spirit, a lot are great for work and I included some clutches and crossbodies for those nights out.